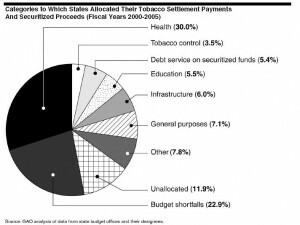 In the same shameless vein as not using the funds as intended, 17 states have been brazen enough to begin selling bonds based on future tobacco settlement payouts and they’ve spent some or all of the money before they have it, according to the National Conference of State Legislatures. This reminds me of the “Structured Settlement” commercials we’ve seen on television whereby companies entice people with an annuitized form of income into settling up front for a lump sum which generally has a horrendous net present value at conversion (i.e. someone wins a lottery and is promised say, a few hundred thousand dollars per year over several years. At a given assumed discount rate of say 5%, it’s hypothetically worth 5 million dollars Net Present Value. The structured settlement pays a one time fee of 2 million dollars to the recipient, turning a huge profit in present day dollar equivalent. Meanwhile, the recipient has the quick cash that Americans have grown so accustomed to and then lives a life of regret over squandering this windfall). Our political leaders are these same sucker windfall recipients and it’s really just par for the course as we’ve come to expect. My god, what would these leaders do if they actually had to maintain a balanced budget on its own merits? Even accounting for these untold Billions of dollars they’ve now squandered, states and municipalities are claiming they can’t meet existing debt and expense obligations, their public pension trusts are shattered by poorly understood and ill-timed bets on exotic investments and we’ve just inaugurated a new president who has made more promises than I can possibly cite here. Maybe they should seek another settlement with big industry and promise the spend the settlement funds for the public good. Perhaps a suit against Wall Street Banks? Perhaps big pharma? Oh, and how about a windfall tax to the oil companies now that oil has lost 70% of its value from the peak last year. We’ll let the politicians handle the rest. A Government Mandated Layoff Freeze? SuperFund Review – Are the Returns Too “Super” to be True?